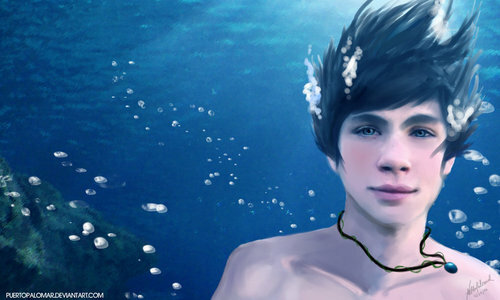 Percy Jackson Underwater. Cute!. HD Wallpaper and background images in the Percy Jackson & The Olympians boeken club tagged: percy jackson percy lightning thief. This Percy Jackson & The Olympians boeken photo might contain portret, headshot, and close-up. OMG! Did someone actually draw that! thats rly cool!! and yeah, technically he should have more beads...unless they fell off...hehe, that would be bad. it looks like someone drew logan's face, than drew the rest of him underwater, then paint it VERY VERY VERY AWESOMELY....... in other words... ITS FREAKIN AWESOME!! !